Welcome to Jane from the consistently inspiring blog Buzzmills! I first took notice of Jane's work when she entered our Feather Your Nest sew along contest last year (and won Judges' choice!). She produced quite a few unique, resourceful and beautiful projects! She presented a few topic options for a guest post for our Inspired By Nature series, and I selfishly picked this one because I want to use some photosensitive paper we have in our craft cabinet! Can't wait to try this, don't Jane's prints look amazing? There has been a blank spot on our bedroom wall since we moved in. We have struggled with just what to put in the space. Nothing too expensive, nothing that will make it feel too cluttered. And then one day... Someone was giving away a package of sun print paper on Freecycle. Well, why not? I'll take it! I thought it would be a super fun project to do with the kids. Do you remember doing sun prints as a kid? I let Violet and Henry pick what they wanted to put on their papers. It was fun to see them wandering around looking for just the right items. The kids thought it was pretty awesome! It turns out that I thought it was pretty awesome too! I loved the cool blue of the paper. And the pictures have a slightly modern feel while also feeling a bit "old school" as well! So I hoarded the leftover pieces of paper ;) and made my own using flowers and herbs from our garden. It took me a while, but eventually I made it to Ikea and bought some inexpensive frames for my new art. And so, I filled the blank space in our room. The four pictures hanging this way mimic a window and really help to open up our small room. The blue looks great against the pale gray of our room and with the yellow and gray of our bed and embroidery hoops on the opposite wall. Now I have "fresh" flowers from our garden in our room every day! And the kids have some new "nature" to add to their hallway upstairs! Of course, there is still a bit of a blank space above the mirror to fill... In time in time... It always has to be a little bit in progress or else you wouldn't have anything to do, right? Oh, and one more thing, before I go... Speaking of nature and art... I thought I'd share where I decided to put my Feather your Nest print from Jenny! A perfect fit, don't you think? Thanks for having me Jenny and Angel! Thank YOU so much for sharing this project with us, Jane! We can't wait to try it ourselves. It looks fabulous. What do you guys think of these botanical sun prints? Aren't you antsy to go pick up some photosensitive paper to try it out? For more posts in our Inspired by Nature series, click the image above. If you have a guest post to contribute, we'd love to hear from you! Shoot us an email at stumblesstitches AT ymail DOT com. Jane, I LOVE these prints. They are gorgeous. I totally agree with your description of "modern meets old school". I am very touched to see my little burlap art piece on your wall. Thank you for sharing that! And thanks a bunch for guest posting! I bet this will inspire many of us to craft (beautifully!) with the nature around us. Wow! Those prints look awesome! I did some prints like this in my college photography classes, but I didn't know they made sun paper. Thanks for sharing. I love these. I have sun print paper that I've never used. This inspires me to give it a try! Gorgeous. I've been concerned about trying this, because I'd feared that I'd make something lame... but you make it look almost idiot-proof. Not that mine will be as lovely as yours, but I still think I will make something nice. Thank you so much for writing a comment! 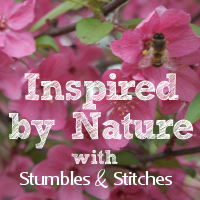 While the format of Stumbles & Stitches is an exchange between two friends, we love to engage with our readers and expand the conversation in the comments. We usually respond to your questions here, unless it seems more appropriate to send you an email. So please check back! Stumbles & Stitches is a creative conversation between two friends: Angel Funk and Jenny Bartoy. For many years, we shared our crafts and sewing projects, wrote tutorials and book reviews, and had a great time getting to know our readers. We have moved on to new endeavors and the blog is now dormant. All content is still available, so please browse and enjoy! I'm a mama of 2 boys in Seattle, WA. Sewing, drawing, embroidering and all sorts of do-it-yourself projects fill my spare time. I strive to upcycle materials when possible, but am also hopelessly hooked on designer fabrics. You can find my handmade textile goods and fiber art in my shop on Etsy or visit me at www.JennyBartoy.com! I live in Nashville, TN and have 2 sons. A self described "craft addict", I love natural materials, especially wool in all its forms. My interests range from hand-sewing and needle-felting to knitting, paper crafts and gardening. You can find me creating with kids at Kaleidoscope. Stumbles & Stitches by Jenny Bartoy and Angel Funk is licensed under a Creative Commons Attribution-NonCommercial-NoDerivs 3.0 Unported License.